It's been a long time coming, and finally in this dress up game you get to combine both male and female characters from xSheepi's Waivera universe! Each gender has slightly differing options, but both allow you to fully immerse yourself in a fantastical, aquatic world. You can customize each character's look, hairstyle, fashion, and then combine them with infinite others into a scene. Choose and colorize your backdrop too! 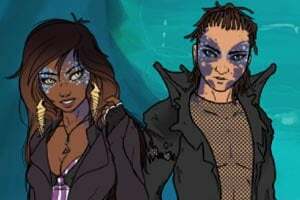 About Waivera: Set x-number of years into the future after a devastating flood hits earth, all sorts of bio-engineered sea creatures own the sea. Regular humans live in tall, skyscraper-like cities which tower over the ocean, while mutated people adapt to the underwater experience, and have to rough-it somewhat more. Tension exists among the caste layers. Millions of years worth of evolution, but only a few centuries of adapting to it... accepting it. The landscape is dynamic and freakish.. ever-changing. High-tech, sci-fi contraptions mix with the decrepit remains of humanity beneath the ocean... the seas filled with genetically engineered sea creatures. Love the fact that you can customize the skin's undertones if you set opacity to 10%!! Super neat feature for us cool toned girls. First comment in 2 years! Anyway, this game is great for creating cyberpunk/grunge characters. Would love to see an update! Can`t remember the last time I played this... Still like it though. You need to go to the background button and click on the save as jpeg button then go to your galleries and click the upload doll button.